This sterling silver Celtic cross charm features Celtic knots and a clip on lobster claw clasp. This sterling silver Celtic cross bead features Trinity knots along with enameled accenting. 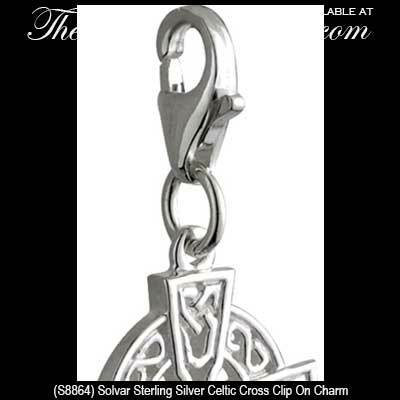 Sorry, this Celtic cross charm is now sold out. This sterling silver Celtic cross charm features Trinity knots and a clip on clasp. As the title would suggest, these charms do not come with a chain; however, The Irish Gift House does have a boat load of Celtic cross necklaces that are complete with a chain. Our largest collection are the silver Celtic cross necklaces; generally speaking this assortment of pendants are best suited for women or girls. If you are looking for a larger pendant take a look at the silver Celtic crosses for men; this selection features masculine pieces with longer and heaver chains. We also stock a large selection of gold Celtic crosses for both men and women and a group of plated Celtic crosses. 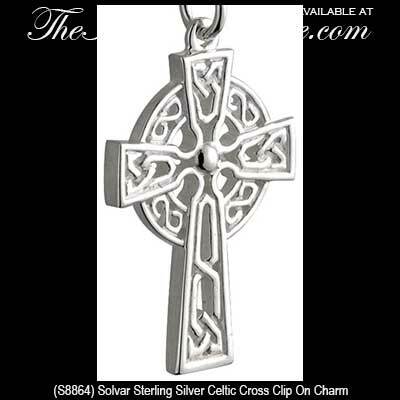 Our collection of Celtic cross charms are made in Ireland by Solvar or O'Connor jewelry.